A Yellow Springs Blog: Hungry..? 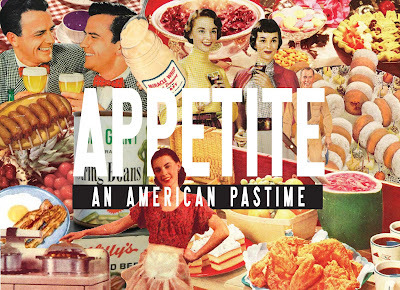 Antioch College is pleased to announce the opening of Appetite: An American Pastime in the Herndon Gallery in South Hall on campus. An opening reception for Appetite: An American Pastime will be held on Saturday, March 16, from 7:00 to 9:00 p.m. The exhibition will continue through May 24. The exhibition explores the following questions: What are the defining attributes of the American appetite and how do they appear in the landscape of contemporary culture? How have the desires of a quintessentially American outlook imprinted the global structure and what impact does it have on those who expect to freely participate within it? This project is a curatorial collaboration between local installation, multimedia artist, and Antioch College adjunct faculty in media arts, Michael Casselli, artists Eric Dyer and Maggie Hoffman, Raul Vincent Enriquez, Stefanie Koseff, and political/cultural theorist, Kurt Miyazaki. Casselli, in his interest to create a more democratic model of curation, initiated the concept (Appetite), and created visual structure (Home) for his invited participants. It is an experiment through which the interior of the Herndon Gallery is radically transformed. Each participating artist has been given an interior “room” in which they stage their responses to the concept of Appetite. This physical/conceptual structure made possible the exchange of ideas between the participants and Casselli that were instrumental in creating the original work which will be presented within the reconfigured gallery space. On Sunday, March 17, at 1:00 p.m., the Herndon Gallery will host Lunch on the Lawn, a conversation and lunch event with participating artist Stefanie Koseff. Gallery hours are Tuesday through Saturday, from 1:00 to 4:00 p.m. For more information, please contact Dennie Eagleson, creative director of the Herndon Gallery at deagleson@antiochcollege.org or 937-768-6462. Stefanie Koseff is a Brooklyn, New York-based video artist who has worked with installation, single and multi-channel work, as well as theater and performance. In her videos, Koseff works towards creating a language and telling stories that use moving images in a non-traditional way, by situating projections in unexpected locations, giving voice to dormant/silent spaces, and freeing the video image from the confines of the screen. Her work often draws on her background in philosophy as well as her personal experiences, which serve as catalysts for the exploration of emotional states while never permitting either theory or the personal to dominate, allowing for universality and leaving room for the poetic expansion of the viewing experience. Eric Dyer and Maggie Hoffman are co-artistic directors of the performance collaborative Radiohole. Originally a drinking and makeout club, for reasons unknown or forgotten, Radiohole began to create shows and perform them in the bars and basements of Brooklyn. Since then, Radiohole has gone on to create eleven critically acclaimed original works that have toured nationally and internationally. The Drama Review has described Radiohole as “the quintessential American performance group.” Their most recent work, Inflatable Frankenstein enjoyed a sold-out run at The Kitchen in January and will be performed at EMPAC on the campus of Rensselaer Polytechnic Institute on March 22. Inflatable Frankenstein will premiere in Europe as part of Festival Temps d’Images at Centquatre in Paris. Raul Vincent Enriquez is a media artist, teacher, and father. His work employs moving image vignettes aimed at amplifying the notion of hospitality, mundane habits, vanity, and man caves. He has a history of hosting events, which foster mastication among audience members. In recent years, he has shown work at the New Museum in New York City, The Stephan Cohen Gallery in Los Angeles, and the Conduit Gallery in Dallas, among others. Kurt Miyazaki is a third generation Japanese-American who resides in Yellow Springs, Ohio, and works in New York City. Kurt received his doctorate from the University of North Carolina at Chapel Hill in 1999, and has taught political theory, ideology and film theory, social theory, and cultural studies. His research has addressed issues of subjectivity, space, and power. Since 2005, Kurt has maintained a small café and gathering space.